If you've spent much time bopping around the blogosphere this week, you'll know it's Banned Books Week. I've been pleasantly surprised to see how many of these banned books I've actually read. And even encouraged my children to read. 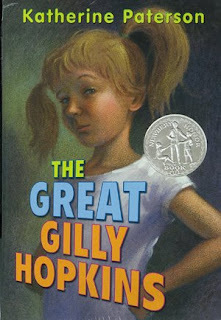 I posted earlier this week on the Class of 2k8's blog about The Great Gilly Hopkins by Katherine Paterson (published in 1978 for approximately 10-15 year olds). The Great Gilly Hopkins is the first decent-sized chapter book (as in over 80 pages) that Child #1 requested after listening to a fellow classmate’s book talk. Since then, Child #2 and Child #3 have read it. This book was banned from several schools and libraries for rough language and Gilly's inappropriate behavior. It's the story of a tough eleven-year-old girl who's been bounced around the foster system. Over the course of the book, Gilly learns to respect herself and others, no matter what the color of their skin. It's won many, many awards including the National Book Award, a Newbery Honor, the ALA Notable Children’s Book List, The Horn Book’s Honor list, the Jane Addams Award, the Christopher Award. People are still banning it. I'm feeling contrary this evening. And you know what sounds good? A drive to Pahrump, Nevada where I'll sit in a public parking lot, waving the Mexican flag and reading aloud from The Great Gilly Hopkins in any language other than English, while smoking a Cuban cigar. I leave you with a fun little quiz from the Florida Institute of Technology Evans Library. You match a few lines of plot with the title of the banned book. Hop over to pattinase's blog for links to other posts on banned books or for Friday's Forgotten Books. Sounds like a great book and a good plan for the evening. Bring enough Cuban cigars for everybody! A great favorite in our house. Thanks much. Thanks, Barrie, for reminding me about Gilly. 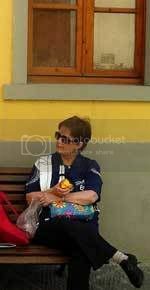 My grandkids are too young to meet her just yet but I will put her on the list! I'll bring the sangria for the Pahrump (boy has that town got the right name!) get-together. Off to take the quiz now. . . It's bizarre the reasons some books were banned. I love banned books. I usually find that banned books turn out to be the best reads. Sounds like a great plan for the evening. Hola Barrie. Here in Wisconsin we simply go to the local factories to see the Mexican flags. Amazing what is being banned today! I can't believe it. Are Box Car Children books banned yet? Yikes. I'll meet ya in Nevada as well! Good post. I'm amazed childrens' books are in a banned category. Adults' books are one thing, but books for children? By the way, I tagged you, if you're interested.